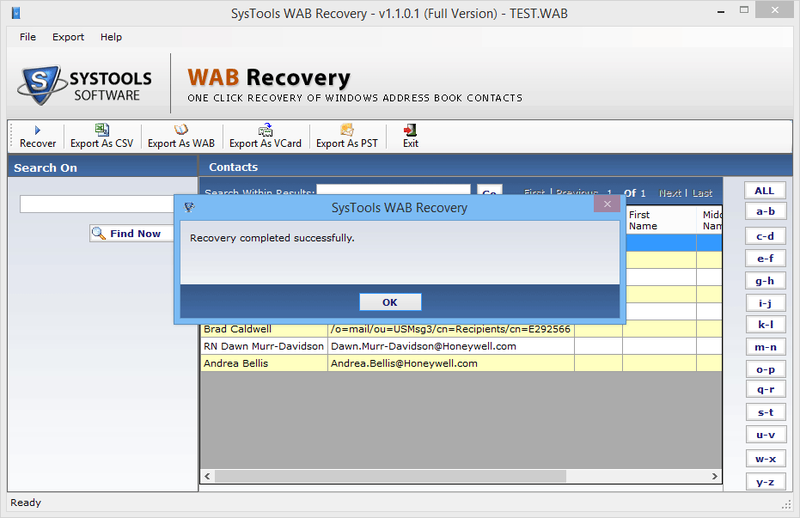 If your Outlooks Express wab contact got deleted or corrupted then you use the WAB Recovery software to get them back instantly without losing any contact information. 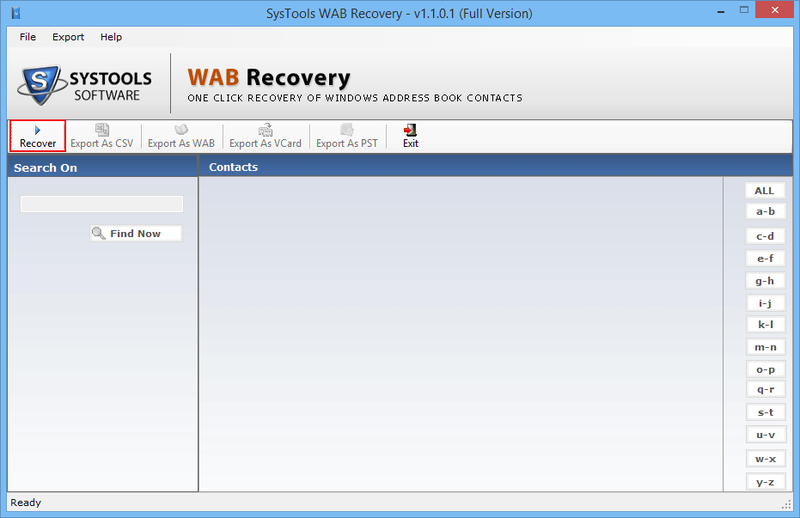 If for some reason the contact got deleted the WAB Recovery software will try to recover them if they still exists within that wab file and give you back in no time. The pro version of the tool gives you the ability to save and export the recovered wab file in four different file format namely in csv, vcard, wab, and in pst file format. The tool primarily is designed for Windows Address Book contacts recovery that exists in your WAB file created either by Outlook Express or Outlook email clients. Easily get access to all your contacts that got missing or corrupted in the WAB file. Your WAB contacts are transferable in other format as well. No file size limitation whatsoever which gives you the ability to view light to heavy files in matter of seconds. The tool will gives you all the information associated with the contacts i.e. name, address, phone number, email id etc. WAB itself (incase if you want to customize your contact list). The WAB Recovery and restoring tool is a complete package in itself and is an all in one solution to tackle the bad situation that you may encounter with the WAB file. Filter down your searched result with the search within function for easier and fast contact access. List and Preview all the contacts without purchasing the software. View all associated attachments within the panel itself. Successfully was tested on tens of thousands of contacts. 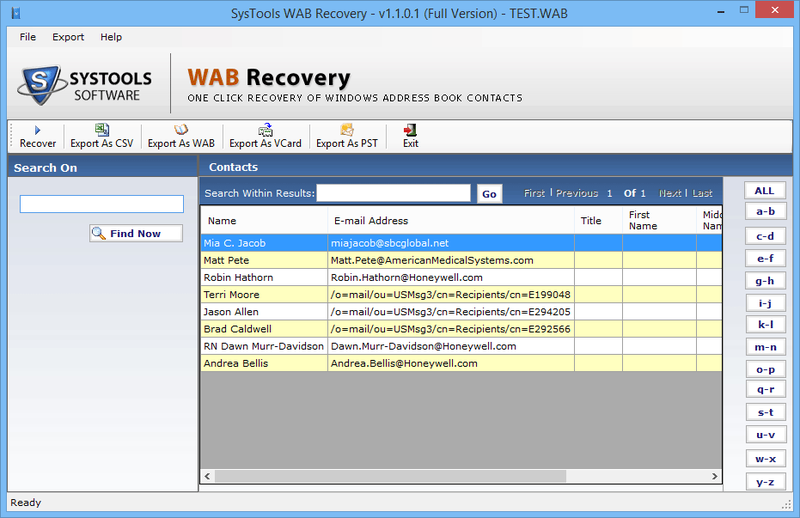 Trial version of WAB Recovery Software allows the users to preview the list of recovered contacts. What is the primary purpose of the software? The WAB Repair software is designed primarily is to help user who have lost access to all their contacts that they have stored in .wab format. If you for any reason are unable to view your contacts then this software is for you and the extra features is that if you only need to view them you can do it for free without having to pay anything to us. What are the facts that I should know about before purchasing the software? 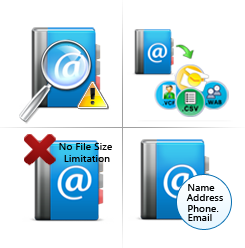 If you want to transfer your WAB contacts in PST format only then you need Outlook Email client to be installed on your machine otherwise you can enjoy the software without any external dependencies. What are the OS the software is compatible with? 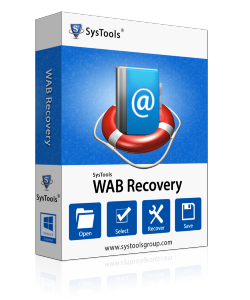 The WAB Recovery software is compatible with all the Windows Operating System and you will be able to install the application from Windows XP to the current Window 10, 8.1 OS. I thought I won't be able to get my contact again but your software made it sure that I get all my contacts the way they were there without changing or modifying the contacts. Glad I have your software, sincerely wants to thanks you guys for making such software. Now I got all my contact back I am going to make sure to make backup of it. Thanks Again.